Factory manufactured, recycled document communications centres, delivering documents without costing the earth. 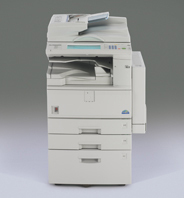 In addition to standard Copying and Network Printing, this 3rd generation digitial technology offers your workgroup options for full multi-functional capabilities such as Network Scanning and central document filing. These systems are quick (27ppm) and easy to use - saving time and enhancing workgroup productivity.